Etched magnums of 2014 Hyde Vineyard Pinot Noir, Los Carneros, with the saying Happy Holidays, Merry Christmas or Congratulations, are now available for purchase. These special edition bottles are sure to impress as centerpieces, host gifts, or rare additions to your cellar. Extremely limited quantities are available. Join us in the heart of Union Square for a perfectly paired evening of coastal cuisine and Patz & Hall’s exclusive wines. 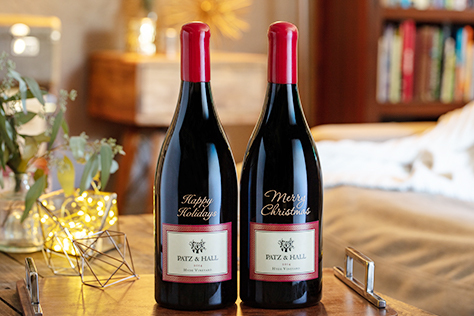 Our private dinner, hosted by Sonoma House Manager Amanda Daighton and Wine Club Manager Becky McIver, will feature Patz & Hall’s most sought after Pinot Noirs and Chardonnays. We’re looking forward to a night of revelry with food, amazing wine and even better company. 21 and over, please. Reservations required.